After years of slow early adoption, B2B marketers have finally grasped the importance of content marketing and ​online marketing automation to improve lead generation, overall productivity and conversion rates. 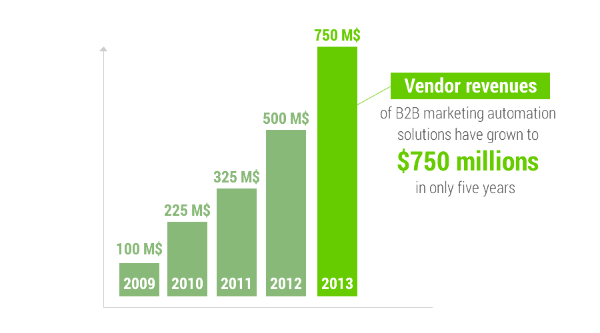 However, many B2B marketers still drag their feet with actual online marketing deployment. As a matter of fact, only half of B2B marketers are already using a ​marketing automation platform. Of those who don’t, more than two thirds are either currently evaluating such a solution, know of existing tools but don’t use it or are simply not aware of the many application and benefits of online marketing automation. To address B2B marketers’ appetite for efficient online marketing, web agencies must therefore propose online marketing solutions that cover all their custom needs and provide straight answers to their most pressing concerns. 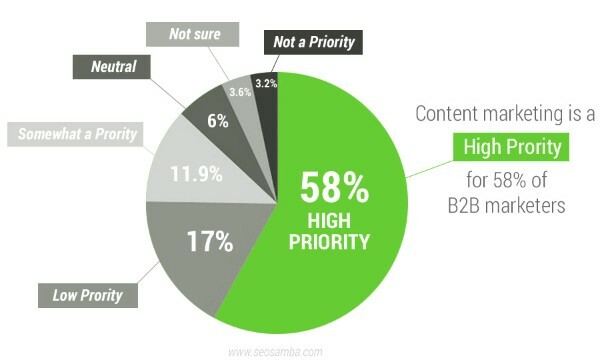 In light of the growing importance of a functional synergy between inbound marketing and online CRM, B2B marketers have made content marketing one of their highest priority for the coming years. 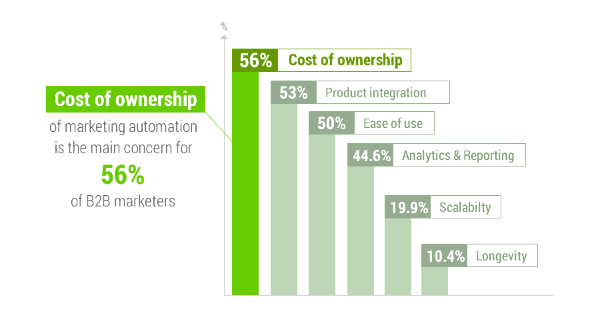 B2B marketers questions about flexibility, scalability and cost of ownership in the long term are more than legitimate. While deploying marketing automation for a mom and pop’s business simply requires to sign up with any online service and get to work, B2B marketers have more pressing concerns. Among the major hurdles are stopping B2B marketers to follow through with a sustained and efficient marketing automation technology: budget constraints (37%), lack of in-house specialized staff (36%) and poor contacts databases (33%). They need to know how they can integrate online marketing within a patchwork of existing processes, websites and online apps. They also need to have a clear path for future developments and scalable pricing models to match their expected usage growth. On top of all that, B2B marketers need to ensure they will get a sizeable return on their investment for training their staff and secure durable, personalized technical support from their solutions provider. These concerns mirror those of web agencies who lack the tools or technical knowledge of their B2B customers. This largely explains why B2B companies rely four times less on agencies for online marketing technical implementation (10.7%) than content creation or design (43%). To alleviate the cost of ownership and technical implementations concerns for B2B companies, SeoSamba allows web agencies, web design contractors and SEO specialists to easily expand their service offering to B2B with a cost-effective, ​all-in-one online marketing solution. Scalable and flexible, SeoSamba leverages a hub & spoke framework made for multi-brands retailers, B2B and vertical distribution networks at the fraction of the cost of traditional solutions. Integrating B2B automated quote engine, SeoSamba also enables out-of-the box multi-sites e-commerce, SEO, social media marketing, global PR & news distribution, real-time analytics and reporting. Thanks to SeoSamba’s white label customization features, agencies can now engage B2B clients with a world-class online marketing solution under their own domain, name and branding as well as their own pricing grid for pay-per-use online services. The next time your favorite B2B client asks you what online marketing automation can do for them, do not shy away or mumble a skittish response. You don’t have to lead them away to competition or other big online business that actually works against smaller, more independent players. By securing a transparent yet reliable partnership between your agency and SeoSamba, you will develop growing recurring revenues while finally providing your B2B customers with all the features, benefits and added value they’ve craved so long for.